Scrape off as much excess food and grease as possible into the trash. The more food you remove now, the longer the wash water will last. Wash - In a wash tub of warm soapy water, clean off all the remaining food residue and grease. Do not move to the next step until it is clean. When done washing, shake off as much soapy water as possible. Rinse - In a second tub of hot water rinse off the remaining soap. 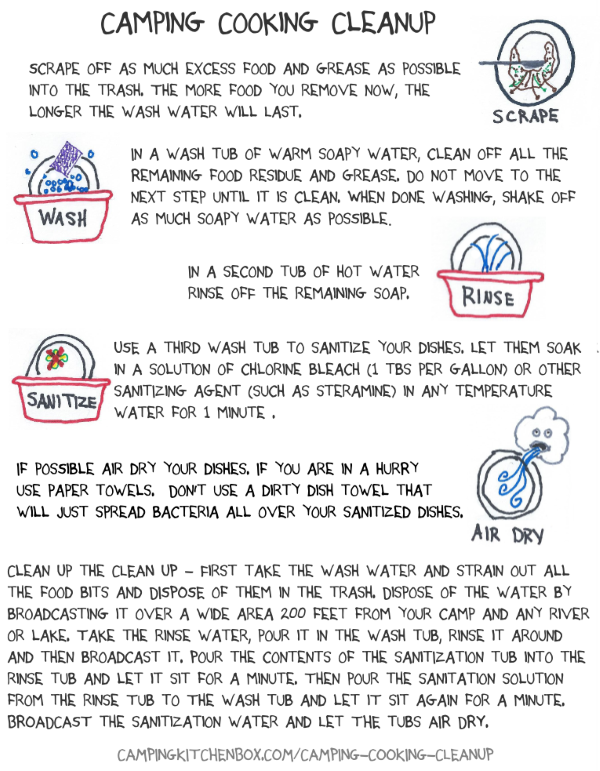 Sanatize - Use a third wash tub to sanitize your dishes. Let them soak in a solution of chlorine bleach (1 tbs per gallon) or other sanitizing agent (such as steramine) in any temperature water for 1 minute . Dry - if possible air dry your dishes. If you are in a hurry use paper towels. Don't use a dirty dish towel that will just spread bacteria all over your sanitized dishes. Clean up the clean up - First take the wash water and strain out all the food bits and DISPOSE of them in the trash. Dispose of the water by broadcasting it over a wide area 200 feet from your camp and any river or lake. Take the rinse water, pour it in the wash tub, rinse it around and then broadcast it. Pour the contents of the sanitIzation tub into the rinse tub and let it sit for a minute. Then pour the sanitation solution from the rinse Tub to The wash tub and let iT sit again for a minute. broadcast the sanitization water and let the tubs air dry.